All Deluxe rooms have private sun deck and semi-outdoor bath room. All rooms are equipped with: A/C , hot / cold water with separate bath tub and shower, minibar, cable TV, coffee & tea, hair dryer and in room safety box. The Bhumiyama has a full range of modern, functional and stylish facilities that you would expect from a luxury beach resort. Notable are the fantastic beach side multi level swimming pools with jacuzzi and kid pool. Relax with your favorite drinks at the pool bar for complete tropical relaxation. The 'By the Sea' restaurant serves fine Thai and European cuisine. Come enjoy the best view on the beach under candle light dinner with someone special. 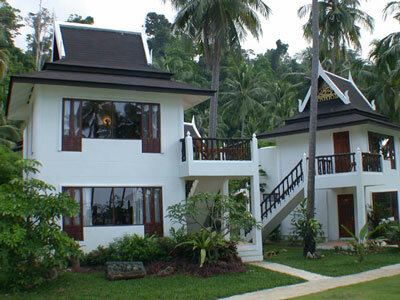 The Bhumiyama is on Ko Chang ( Chang Island ) in Trad province, the eastern most province of Thailand. Koh Chang is the second largest in Thailand after Phuket. However more than 80 percent of the island's land mass is a national park forest reserve with some of the best preserved tropical jungle in all of Southeast-Asia. That's the reason why we picked it as our home, to build a tropical resort, in an uncluttered traditional Thai style with all modern amenities. To have our guests relax in a natural setting with tropical forest to the rear, white sand and turquoise ocean to the front. The beach is called "Tha Nam" beach or the more well-known name is " Lonely Beach" made famous by travelers who commented in Lonely Planet guide books as to be the best and most beautiful beach on Koh Chang. For your enjoyment the Bhumiyama invites you to a swim in the beach side multi level swimming pools with Jacuzzi and kid pool. Relax with your favorite drinks and refreshments at the pool bar.